Albrecht Dürer Gesellschaft - Germanisches Nationalmuseum Nürnberg, Albrecht Dürer zu ehren, 23 May - 29 August 1971, no. 1. American Friends of Le Korsa (AFLK) is a non-profit organization that works directly with dedicated doctors, nurses, teachers, and students in rural Senegal. Created through the Albers Foundation, we are relatively small-scale, but are astonishingly effective in saving and improving human lives by operating programs at carefully selected sites and responding quickly and immediately to emergencies. Our actions are concrete, designed to fulfill urgent needs, and the results are extraordinary. In the rural village of Sinthian, we work with the one doctor in the region, Magueye Ba. With his guidance, we support two fantastic small medical centers and a kindergarten, which we built. Last year, we added the dimension of cultural exchange by having gifted dancers from Wayne McGregor's Randomdance go to Sinthian and run workshops. Now we have begun construction on THE CENTER: le centre culturel Albers à Sinthian. The design, by Toshiko Mori Architects, has already won an AIA award and been selected for the Venice Biennale. It and the supervisory work have been given pro bono by the architects. THE CENTER provides housing and workspace for two visiting artists. The residencies will be awarded to painters, writers, dancers, musicians and others who will be able to focus on their own work while at other times interacting with the local community and opening doors to a population that has had little exposure to anything in life other than the bare necessities of survival. THE CENTER has been designed to provide ample communal space where the villagers can gather, and the roof structure has been engineered to capture and retain enough rainwater to supply the village for 40 of its annual water usage. Proceeds of the funds raised by the purchase of this painting will go entirely to the life-saving work of AFLK and the construction and operation of THE CENTER. The Josef and Anni Albers Foundation supports all of the operating costs and overhead expenses of AFLK, ensuring that at least 98 of donations to AFLK go directly to the medical care, teachers' salaries, scholarships, and, now, the work of THE CENTER, which we fund and closely supervise on site. The name Homages to the Square is the first hint that nothing here is quite as it purports to be. The title is misleading, a bit ironic. These are not homages to the square so much as "platters to serve color"--the term Josef used for them. They are hymns to the infinite possibilities, both physical and spiritual, of hue and light. What appears to be very straightforward, mechanical, and simple is ultimately mysterious and ambiguous. Albers always used paint straight from the tube, applying it with a knife, never putting a color over another color, invariably starting at the center and carefully ushing one color up against the next without ever overlapping them. There was a reason for all the rules that he followed with such ferocious singularity time and again in this series of paintigs. The flat colors gain extraordinary movement and three-dimensionality. 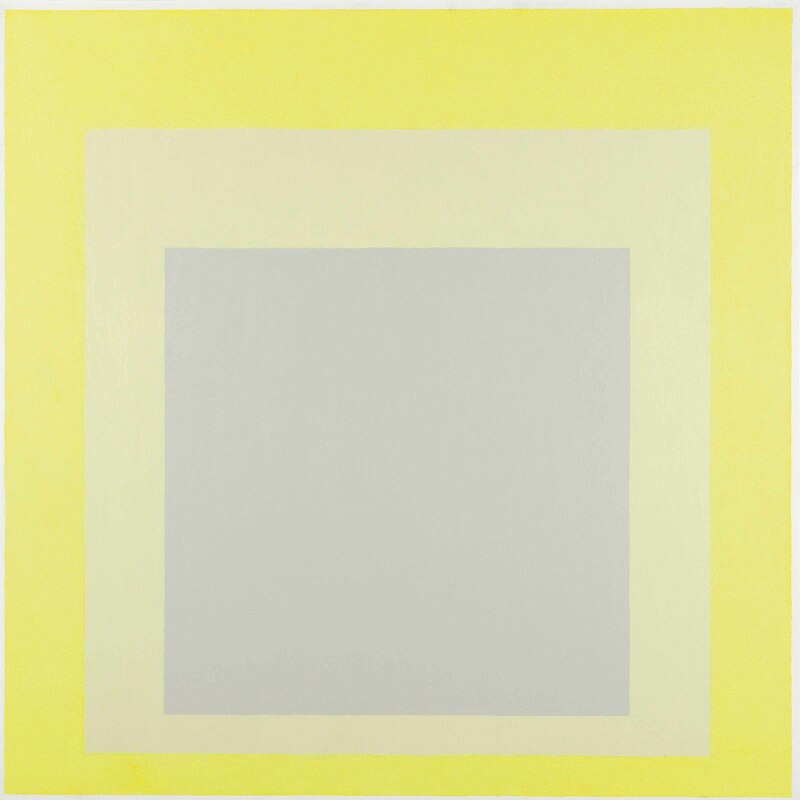 "In action," Albers wrote, "We see the colors as being in front of or behind one another, over or under one another. They give the illusion of being transparent or translucent and tend to move up or down." And then the colors interact. Perfectly flat areas appear shaded; the squares grow darker near one boundary and lighter near another. Nothing is as it seems. In 1971, Albers painted these words in large and distinctive white lettering on the back of this work after learning that it would be included in an exhibition organized by the Albrecht Dürer Gesellschaft at the Germanisches Nationalmuseum Nürnberg. What Albers wrote following Dürer's name roughly translates to "In honor of his looking outward and his looking inward." Albers had admired Dürer's work going back to the time period when he studied art teaching in Berlin from 1913 to 1915. This is the only known occasion of Albers's making an inscription of that sort on one of his paintings, and the quality he attributes to Dürer of combining observation of what we see and reflection on our own inner workings was his artistic ideal. Albers may well have modeled the straightforward "A" monogram he used on all of his Homages to the Square on the "A.D." of similar style which Dürer regularly used.